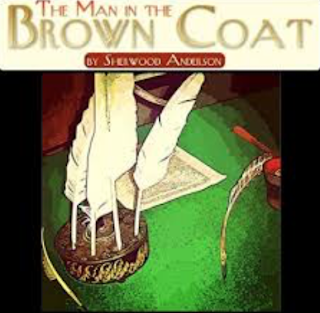 'The Man in the Brown Coat' by Sherwood Anderson is about a man who grew up in a poor family and who achieved a success in his life: he writes historical books and he owns a house. The story was written with the use of very short sentences. This literary method created a feeling that the main character's thoughts were expressed in short phrases. This impression increased because the author combined his sentences with the quotes from typical historical narrations like "Napoleon went down into a battle riding on a horse". The narrator writes about his wife. She has gone out of the house and she does not know that her every little thought is known by the narrator. He hears the voice of her mind. It can express fear when she says the words of courage. Very often her true fillings are opposite from what she says. He likes her but he is not able to break the barrier in their relationship. The title of the story 'The Man in the Brown Coat' represented the main idea of the story: the loneliness of the person behind the barriers which he created. There are no big efforts to step out of the space which he made around himself. The controversy of private and social life was displayed by Sherwood Anderson in this very short story.